Ewer; bloodstone; gold, enamelled and jewelled handle, spout and mounts; oviform body with band of flutes around shoulder; oval foot and mouth; spout in form of half griffin with white bust and blue head, with emerald pendant; handle in form of winged serpentine monster, blue and green head, white and yellow body set with rubies and emeralds in four rows; on it is seated Cupid with a poised bow; mouth, cover and foot mounted in openwork, enamelled white with rubies and diamonds in high settings; knob of cover is a ruby bead. Origin: Uncertain; previously described as 'French or Italian, 16th century', but more probably only the oviform body of the ewer can be given that attribution; the neck, lid and foot, together with the gem-set and enamelled gold mounts, are later additions made before 1834 - perhaps in London c. 1811-30. Provenance: Formerly in the collection of the Dukes of Devonshire; recorded in a manuscript 'Inventory of Curiosities and Articles of Vertu at Devonshire House, 1834'; also listed under the heading of 'Vases of Stones' in the 1892 Inventory of Devonshire House, London; lent by the 8th Duke of Devonshire to the Burlington Fine Arts Club Exhibition of European Enamels, 1897; acquired by Baron Ferdinand Rothschild about one year before his death in December 1898, and visible in a photograph of one of the vitrines in the Smoking-Room at Waddesdon Manor towards the end of his privately printed ‘Red Book’, the Foreword of which is dated 1 November 1897 (see also WB.68 and WB.70 – WB.72). Commentary: The survival (below the neck) of the disused 'platform' - albeit ground down to the level of the adjacent moulding - provides the most telling evidence. It establishes beyond doubt that the oviform body of carved heliotrope was originally mounted in gold in accordance with normal sixteenth-century practice - not by methods such as drilling, riveting and cementing, which are typical of more modern craftsmanship. During the Renaissance, a 'platform' was cut and left unpolished whenever it was intended to attach another element (like a handle or a spout), using a gold mount or collar to unite them, because it enabled the goldsmith to 'grip' or wrap the soft gold around the projecting 'platform' without piercing and, perhaps, damaging the precious polished stone. This interpretation of the visible evidence remaining on this ewer is reinforced by the conflicting and very mechanical quality of the turning of the lower section of the neck, which is literally cemented on to the mouth of the oviform body, with an inner flange projecting downwards (on the inside) below the moulded rim of the oviform body. In addition, the colour of the heliotrope used for the two sections of the neck and for the oval lid and foot is neither the same nor as subtly flecked with red as the heliotrope that had been used for the oviform body. Indeed, these four small pieces lack the virtuosity of cutting that distinguishes the oviform body. The classic proportions of the oviform body and the restrained simplicity of its two zones of fluted relief ornament are stylistically attributable to a Court workshop in Italy in the sixteenth century, and in particular may be compared with the similarly shaped but larger vases and covered goblets of rock-crystal that were carved in the Milanese workshop of Annibale Fontana (born Milan 1504, died there 1587) and of the Saracchi family (see R. Distelberger, Beobachtungen zu den Steinsechneiderwerkstätten der Miseroni in Mailand und Prag, ‘Jahrbuch der Kunsthistorischen Sammlungen in Wien’ vol. 74, 1978, pp. 79-152; D. A. Iñiguez, ‘Catálogo de las Alhajas de Delfín’, Museo del Prado, Madrid, 1989, pp. 151-5, nos 90-3; also ‘En Världi i miniatyr’ 1982, p. 110, no. 195, col. pl. on p. 55). Significantly, the method by which the circular enamelled gold collar unites the two sections of the neck is entirely dependent on the modern techniques of drilling six holes close to the rim and using rivets (introduced from the inside) to make it secure. The heads of the rivets of the rim-mount above are even more unsightly, for they become visible immediately the hinged lid is lifted. Since the enamelled decoration and the gem-settings are the same, not only on these two neck-mounts but also on the lid, handle, spout and foot, it is evident that they all have a modern origin. Furthermore, the lid does not close - it merely rests on the rim-mount of the neck and, consequently, will swing open whenever the ewer is tilted towards the handle. Because the hinged lid is surmounted by a tall spinel, the baluster pinhead of gold at the apex comes in contact with the white enamelled thigh of the Cupid (seated on the handle) whenever the lid is raised to a vertical position. Over the centuries such a design would undoubtedly have caused the enamel to be rubbed and damaged at that point - which it is not - and, like the black spots on the gold collets that are not true enamel, such inferior solutions seem not to be consistent with Renaissance Court workshop practice. Finally, the style of the gem-set and enamelled gold mounts on this ewer is seemingly directly derived from that homogeneous group of brightly coloured enamelled gold mounts that are found in French seventeenth-century collections, such as those of Cardinal Mazarin and Louis XIV, now preserved in the Louvre, and the Grand Dauphin, now in the Prado (see D. Alcouffe, The Collection of Cardinal Mazarin's Gems, ‘Burlington Magazine’, CXVI, 1974, pp. 514ff., fig. 19; J.-J. Marquet de Vasselot, ‘Catalogue sommaire de l’orfèvrerie, de l’emaillerie et des gemmes du Moyen Age au XVIIe siècle, Musée du Louvre’, Paris, 1914, pp. 132-67, pls LX-LXII; Iñiguez 1989, nos 2, 3, 6, 19, 43 and 44). Within these documented collections, the two most outstanding examples to be seen in the Louvre's Galerie d'Apollon are the tall ewer with the bust of Pallas Athene and the dragon-handle, and the large eagle ewer with a siren handle (see Steingraber (ed. ), ‘Royal Treasures’, trans. Stefan de Haan, New York, 1969, p. 34, figs 20-1); however, despite certain superficial resemblances, both these pieces serve to emphasise the differences in the enamelling techniques. The same fundamental differences are observable on the Prado's large lapis-lazuli bowl with a stem composed of a white enamelled caryatid putto between polychrome dragons, dolphins, shells and festoons of fruit (Iñiguez 1989, no. 2, pp. 24-5). However, a much closer parallel does exist between the goldsmiths' work on this heliotrope ewer in the Waddesdon Bequest and the agate tazza in the Prado, which (in the 1776 Inventory of the Treasure of the Dauphin) was listed as “Vaso abarquillado, no. 77” (see Iñiguez 1989, no. 19, p. 44, where there are two colour plates, including a detail of the enamelled figures, and where it is described as “about 1600”). In the style both of the lapidary work and of the enamelled goldsmiths' work there are some striking similarities, especially in the figure group of the winged Cupid riding on a more sparsely gem-set serpentine sea-monster. However, not only is the latter richly decorated with both translucent and opaque enamels in a wide range of colours, but the type of gold settings used for these table-cut gemstones is typical of all documented Renaissance jewellery and differs completely from those on the Waddesdon Bequest's ewer. Furthermore, the polychrome enamelling on the serpentine sea-monster in the Prado displays a technical skill far superior to that of the London version. Similarly, the rider, a white enamelled Cupid with polychrome enamelled wings, not only has a quiver of arrows slung from a sash studded with a row of table-cut diamonds but also holds in his raised left arm a golden bow with which to shoot the arrows. This standard late Renaissance representation of Cupid is both more convincing and better modelled than the London version, in which the twisting, half-kneeling, chubby Cupid appears to hurl his arrow in the typical mid-eighteenth-century pose so beloved of French artists and decorators like Dodin and his contemporaries at the Royal Porcelain Factory established at Sèvres in 1756, on whose wares innumerable Cupids of this type float on painted clouds (see H. Tait, Sèvres Porcelain in the Collection of the Earl of Harewood, Part I: The Early Period, 1750-60, ‘Apollo’, June 1964, pp. 474-8, figs 3-4; S. Eriksen, ‘Sèvres Porcelain: The James A. de Rothschild Collection at Waddesdon Manor’, Fribourg, 1968, nos 3, 11, 12, 18, 19, 24, 25, 29, 31,33 and 42; also R. Savill, ‘The Wallace Collection Catalogue of Sèvres Porcelain’, London, 1989, nos C241-50). Finally, the sea-monster on the Prado's tazza is part of the established repertoire of Mannerist ornament well known from the engraved designs of Northern artists like Hans Collaert (c. 1530-81), whose most relevant series were published in Antwerp in 1582 (see Horst Appuhn, ‘Renaissance-Anhänger’, Pforzheim, 1970, figs 13-14 and 21, where ten of these engravings - all from the Kunstbibliothek der Staatlichen Museen, Berlin - are reproduced, together with a version in enamelled gold entitled 'Grosses Meeresungeheuer', which is undoubtedly not genuine). On the other hand, the curious form of the horned sea-monster that forms the Y-shaped handle on the London ewer is as unfamiliar as the so-called 'demi-griffin' that forms the spout - a particularly obtrusive feature that has failed to be successfully integrated into the overall design of the ewer. The importance of these enamelled and gem-set mounts, executed in the early seventeenth-century style, is greatly enhanced by the present discovery that they can be reliably dated before 1834. 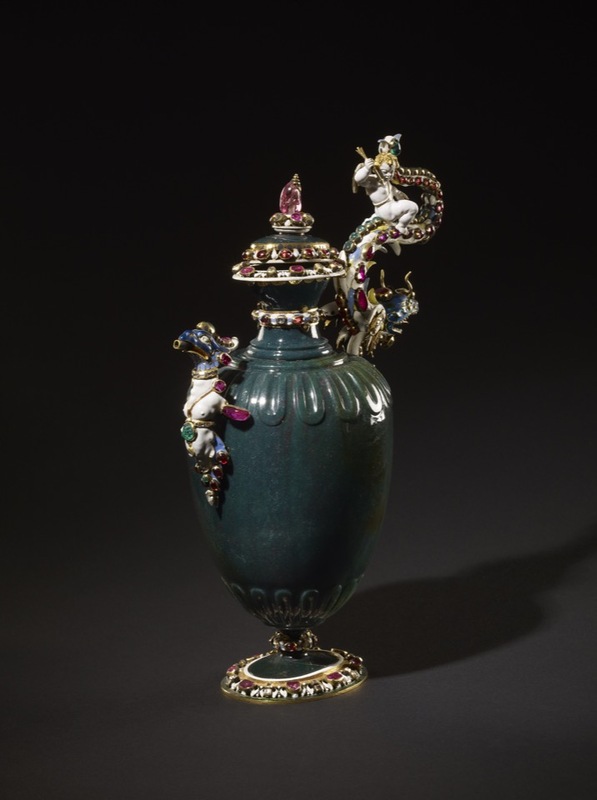 This ewer was described in the 'Inventory of Curiosities and Articles of Vertu at Devonshire House, 1834' as: “A fine Green Jasper Ewer, richly mounted in Gold with Emeralds and Rubies, Grotesque Monster, handle with Cupid in Enamel.” By the time the ewer came to be published in 1897, when the 8th Duke first lent it for public exhibition, it was described as having “Italian incrusted enamel, 16th century”; neither in Read 1902 nor in Dalton 1927 was this attribution wholly abandoned, although it was in Read 1902 that it was first stated that the ewer “may well be French, and resembles designs for ewers by Androuet du Cerceau”. Whereas a slightly later French source - early in the seventeenth century - seems to have been used by the goldsmith, the mounts can no longer be accepted as genuine. In the absence of any mention of this ewer in the 1811 Inventory of Devonshire House or in any of the pre-1834 records at Chatsworth, it may be deduced that the 6th Duke of Devonshire (born 1790, inheriting title 1811, died 1858) was responsible either for its acquisition in its present form or for commissioning the various additions and embellishments. His activities as a collector, especially his known interest in hardstones and mineralogical specimens, gems, marbles and so are discussed in the Curatorial Comment of WB.68. If the 6th Duke himself had the Renaissance oviform body transformed into this strange ewer with gem-encrusted and enamelled gold mounts, it would most probably have been made in a Paris or London workshop, perhaps the same workshop that created the Fonthill ewer, which the London antiques dealer Edward Baldock sold to Sir William Beckford in 1819 (see Hugh Tait, ‘Catalogue of the Waddesdon Bequest in the British Museum: Vol. II. The Silver Plate’, London, 1988, pp. 16-18, fig. 2; also C. Vincent in ‘The Jack and Belle Linsky Collection’, Metropolitan Museum of Art, New York, 1984, p. 179, no. 95, with col. pl.). He sold it as the work of Benvenuto Cellini (1500-71) by using a late seventeenth-century carved smoky crystal (perhaps from the Miseroni workshop in Prague) and mounting it in lavishly gem-encrusted, enamelled mounts, chiefly fashioned in the form of curiously designed dragons and grotesque beasts. The identity of this Regency faker - perhaps a French refugee from the Revolution - has not yet been established, but his imaginative inventiveness and his technical skills are now beginning to emerge as major formative factors in the evolution of nineteenth-century faking, especially in the imitation of the Renaissance goldsmiths of the sixteenth and seventeenth centuries. Hugh Tait, 'Catalogue of the Waddesdon Bequest in the British Museum. III. The Curiosities', British Museum, London, 1991, no.29, figs.270-275.Similarly carved jade urn in collection of Cardinal Mazarin in the Louvre, fig.182 in Patrick Michel, Mazarin, Prince des Collectionneurs, Paris 1999. Thought there to be 17th Century.